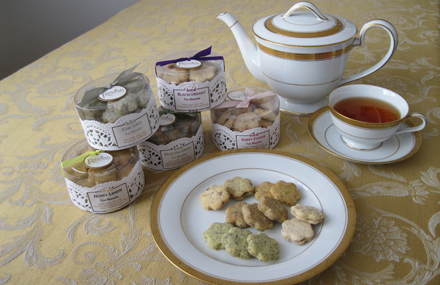 For the British, imagining a cup of tea without a cookie is almost traumatic. Touched by the same uncompromising spirit the creative force behind all our products decided to put the tea in the cookie, just in case you have a cookie but no tea. Have a cup of tea in a cookie! These dainty flower-shaped cookies are packaged in pretty lace-trimmed canisters (3-3/8”dia. X 2”H) and tied with colorful ribbon. EARL GREY – made with Earl Grey ground tea and orange zest. MATCHA GREEN – flavored with Matcha green tea powder and bits of green tea flavored almond praline and rice crispies. HONEY LEMON – made with ground black tea, lemon juice, lemon zest and honey. BERRY FUSION – fruity flavored biscuit with bits of dried cranberry and strawberry flavored almond praline. BLACKCURRANT – blackcurrant tea cookie sandwiched with blackcurrant jam.